Digital technology is already having a significant impact on farms across the country, helping producers manage crops and livestock in ways which were unthinkable just a few years ago. 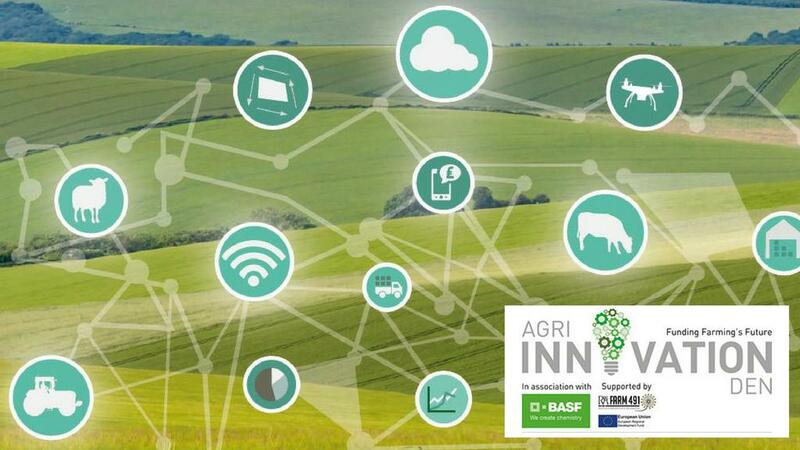 While these methods will continue to develop, there remains a need to foster new, even radical, thinking to help drive technology at an even faster pace, says Louis Wells, solutions and services manager at BASF, lead partner in the 2018 Agri-Innovation Den, a competition launched by Farmers Guardian’s parent company AgriBriefing in 2015 to discover and support entrepreneurs in UK agriculture. Agri-Innovation Den is a key part in unearthing these innovative ideas, says Mr Wells says. “Agri-Innovation Den offers an exceptional opportunity for start-ups and young companies in the agricultural space to grow their businesses. Mr Wells believes there is an opportunity to look even earlier in the process, involving people who may not necessarily be in agriculture, but who can bring fresh ideas to the table to help drive thinking forward, perhaps producing the Agri-Innovation Den competitors of the future. It was for this reason BASF became involved with a recent hackathon event, which aimed to stimulate this seedling innovation. The >Sudo GROW hackathon was devised and developed by innovation facilitator Agri-Tech East, an independent membership organisation, and hosted in partnership with entrepreneur development specialist Allia Serious Impact. It was sponsored by BASF, Barclays Agriculture and business facilitator Smithson Hill. Nine teams of four to five people attended the weekend-long event, believed to be the first agri-hackathon in the UK, held in Cambridge in April, and its success underlines the exciting potential this approach holds. Mr Wells says: “A hackathon is a ‘sprint’ event involving a wide range of participants and contributors, with different experiences and expertise, to collaborate intensively on software projects within a given timeframe. Dr Belinda Clarke, director of Agri-Tech East, explains the >Sudo GROW hackathon was a new approach which aimed to stimulate new thinking around challenges in the industry. She says: “Some of the biggest companies in the world – Apple, Google, Microsoft – are relative newcomers and their disruptive impact is spilling into agriculture. “We now see start-ups describing themselves as ‘Amazon for agriculture’ or ‘Uber for Farming’, demonstrating how a business model or approach successful in one sector can be applied to another. Three challenges were set: supporting and enhancing traditional approaches to weed control; making food production more accessible; and data integration to provide more accurate assessment of growing conditions. BASF set the first challenge. Mr Wells says: “I described the various challenges growers face with weed control, in particular black-grass. “I explained this now infests more than one million hecatres of UK arable crops, and herbicide options are becoming increasingly limited as resistance increases in the population. Two teams completed the challenge. The winner of this section, and overall winner of the hackathon, was a team called WeedSpot, which used a computer gaming engine to create 3D images of a wheat field and weeds. The team used this virtual environment to train the algorithms (instructions a computer follows to execute a programme) to recognise black-grass against the background of a growing crop. WeedSpot’s approach is based on software which is being used to develop driverless car technology. It could have real merit, helping identify black-grass plants in crops as early as one to two true leaves right up to heading. The online entry process is now open until September 28, 2018, here. Runner-up in the weed section was WeedBeGone, which looked at electrocuting weeds using a specialist tractor-mounted boom. The >Sudo GROW hackathon made for an interesting, exciting and fun weekend, says Mr Wells. “This seems a great way of discovering new ideas and developing them into technology which can have potential applications not just for BASF, but for the wider industry. Mr Wells believes Agri-Innovation Den is a natural progression from the hackathon concept, offering a great opportunity for start-ups and young companies that are further down the line. He says: “As well as helping unearth new talent and ideas, both these concepts demonstrate to those outside agriculture that our industry can be a diverse and exciting place to work. Dr Clarke says: “The interest and intensity in working out how to automate weed identification, model the weather or remotely manage crop production was overwhelming. “Innovation is best if it is addressing well-articulated industry problems. BASF gave brilliant support for this, not just by helping make the event possible through funding, but also by participating and lending insight. “We were delighted that more than 50 per cent of participants were new to agriculture, having deep technical backgrounds in coding, data analysis, software management or electronics. The passion of the teams to help make the lives of farmers easier and more cost-effective, while protecting the environment, was clear to see. “The hackathon outputs showed what is achievable, in even a short-time, when excellent people from disparate backgrounds focus their considerable skills on a new challenge. There is so much innovation occurring within different disciplines that previously would not have been associated with the agriculture sector, but now are recognised as key to its future, says Dr Ali Hadavizadeh, programme manager of agri-innovation hub Farm491. Hackathons play an important role by helping bring new ideas and people into the sector, he believes. They create a focused environment where everyone is united with one idea, to create something that will solve a specific problem, encouraging a solution-focused approach. He says even if the idea is not perfect, it is a rapid way of building innovation. Dr Hadavizadeh says: “At Farm491, we are seeing common challenges across the agri-tech industry, and hackathons are a fantastic way of bringing in fresh thinking to tackle these problems. “Testing any idea to ensure the solution meets the needs of the ultimate end user, the farmer, is key to a successful agri-tech business. We see Farm491 as playing that role. “Farm491 provides high-spec facilities created to foster entrepreneurship, ideas generation and collaboration, creating innovation around applying technology to the growing environment.